Today the Center for Media and Democracy is filing its appeal from a claim by the U.S. Department of Education (ED) that it has no records about closed or never-opened charter schools referenced in its "Commitment to Transparency" press release. On December 23, ED publicly issued a statement called "A Commitment to Transparency: Learning More about the Charter School Program." That statement noted that it had spent more than $1.6 billion funding more than 2,600 charter schools that were "operational" in the last full school year and that it had funded 430 charters that had "subsequently closed," along with 699 "prospective schools." However, ED released data for the operational charter schools and others and did not list data identifying which of the 1,129 charters either had closed or had not yet opened since 2006. So, in January, CMD requested records about those other charters. 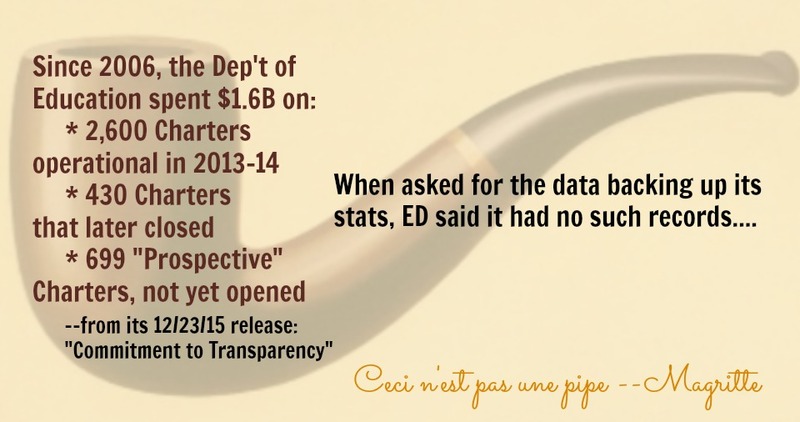 In April, ED denied CMD's request saying it had searched and found no records about the closed or not-opened charters that had received federal taxpayer monies, despite the specific numbers it used in its release. It strains credulity and common sense that, despite spending billions in taxpayer dollars on charters and putting out this press release—among several—on the accomplishments of the Charter Schools Program, the Department claims to have no databases, no data analyses, and no internal communications about the program mentioned in its press release and charters that received funds but closed or never opened, nor any external communications with charter school grant recipients about the success or failure of those charters. The Department's article states that, "CSP planning and startup capital facilitated the creation of over 2,600 charter schools that were operational as of SY 2013-14; approximately 430 charter schools that served students but subsequently closed by SY 2013-14; and approximately 699 'prospective schools.'" Yet the Department claims that it was unable to locate any lists of what schools those are, how much federal funding they received, or any correspondence or other records relating to that data. Similarly, the Department claims that is has no records relating to an assessment of the suitability or eligibility for financial support of "prospective schools" and no correspondence regarding charter schools that closed or never opened. Accordingly, the search conducted by the Department of Education's Office of Innovation & Improvement for records responsive to our requests must have been inadequate. As CMD was first to document last year, the federal government has spent more than $3.7 billion in taxpayer dollars fueling the charter school industry since the 1990s, and ED has now calculated that it has spent more than $1.6 billion of this sum since 2006. The Center for Popular Democracy and the Alliance to Reclaim Our Schools has tracked more than $200 million in fraud and waste by charter operators in the past decade or so, and many--but not all--of the charters whose operators were indicted for criminal fraud were subsequently closed. Charters have closed for a variety of reasons, as CMD documented in its "Charter School Black Hole" report, including fraud, mismanagement, poor enrollment, and poor planning. Meanwhile, as CMD noted, several audits and reviews have found that federal and state overseers have failed to monitor the spending of taxpayer money by charters or to follow up adequately when charters closed after receiving federal or state taxpayer monies. In numerous instances, states could not even identify where the assets went that were purchased by failed charters to reclaim them for the government. In essence, public assets had been converted to private ones and then were unaccountable when a charter failed. And, lobbying groups like the American Legislative Exchange Council have peddled legislation in states to exempt charters from financial accountability and other rules--while federal and state charter advocates in government agencies have been giving favorable ratings to states with "flexible" rules or loopholes governing charters. Using other federal data, CMD sought to determine which charters had closed or never opened ("ghost charters") after receiving federal funds and was able to identify more than 2,000 since the inception of the federal Charter School Program more than two decades ago, but some of those had been assigned new identification numbers because they had changed their names or locations or their status in some way. So, in response to ED's "Commitment to Transparency" statement and its release of data about "operational" charters, CMD sought records used and accessible to the federal Department of Education about the 430 federally-funded charter schools that the federal government had identified as closed since 2006, along with the 699 it has funded but not yet opened. But ED claims to have no records related to those failures or to the prospective schools it claims are worthy of federal funding because their "operators are best positioned to open high quality schools." In CMD's view, it is impossible that the agency has no records about charters that were deemed to have "high quality" potential and none about those whose potential failed to manifest or measure up. ED's denial of CMD's requests under the Freedom of Information Act comes in the wake of repeated assurances that the agency will provide greater transparency and oversight over charters as it seeks continued increases in funding for charters. It also comes in the aftermath of the decision by the agency's Office of Innovation and Improvement to award its largest grant last year to Ohio, despite the public scandal over the state's charter school leader fixing test scores to misrepresent the performance of charters to the public. CMD had requested that ED make public the names of the states and applications for that Charter School Program last year, so residents could learn whether their states were seeking more charter school funding and weigh in, but the agency refused to make that information public until after it had made its decision to award $71 million to Ohio and tens of millions more to other states. When it made those applications public after allocating taxpayer money, it turned out that the government had been provided only letters of support from the charter school industry favoring those grant awards and the government did not solicit or receive information from citizens concerned about fraud, waste, and other problems with charters--like Ohio's effort to manipulate public opinion about charters by hiding the terrible test results of virtual charters. In the meantime, CMD has documented ED's deferential culture toward charters as shown most recently by its obedience to a request by the KIPP "public school" charters to keep secret from the public information about how many of its charter students graduate from high school and enroll in or graduated from college, along with key information about how it is spending federal tax dollars, even as KIPP has spent millions of dollars on luxury trips to Las Vegas, DisneyWorld, and other resorts for KIPP charter employees in recent years. More information about CMD's appeal is available in the primary documents uploaded below. Lisa Graves is President of the Board of the Center for Media and Democracy (CMD) and co-founder of Documented Investigations. She served as CMD's executive director for eight years from July 2009 through October 2017. CMD launched its award-winning ALEC Exposed investigation after a whistleblower gave Lisa all of the model bills secretly voted on by lobbyists and lawmakers. CMD also publishes PRWatch.org, SourceWatch.org, and ExposedbyCMD.org.